Thinking about baking Brownies ? An important consideration when baking these little chocolate morsels is your choice of brownie pan. Even though a classic brownie recipe calls for a very few ingredients, the baking process as well as the tools are equally important if you want to create a beautiful, delicious and delightful batch of brownies. You probably know all the brownie baking rules. Don’t over bake your brownies. Measure your ingredients well. Choose the best ingredients. Don’t over-mix the batter. Choose the brownie recipe that is right for you. 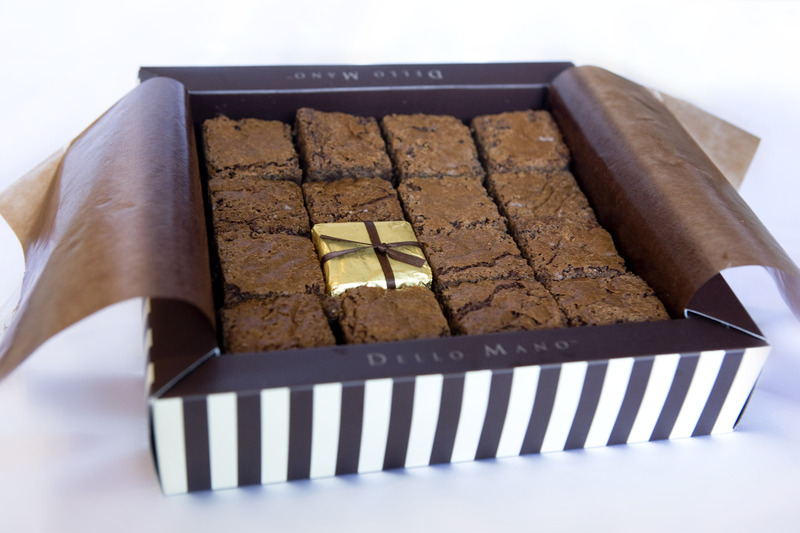 And like Katherine Hepburn the famous Hollywood Movie Star said – never add too much flour to your brownies! But one of the most important things you need to consider before you put your brownie into the oven – is choosing the right pan. What kind of baking pan is best for brownies? And how do you prepare it? Choosing baking pans is one of the hardest jobs for a baker. The thing is that it isn’t only the ingredients and how you put them all together that matter. Remember that much of the Brownie baking process is done inside the oven so you have to make sure everything – including the pan and temperature of the oven – is right. But with all the different types of pan available out there, from the thin iron pans to the posh and expensive glass and specialty pans, choosing can be really tough. So what pan do you use for baking brownies? Most bakers and chefs out there would agree that for home baking the dull aluminium pans are best for baking brownies. Try not to use dark-coloured pans as they often cause brownies to brown faster, which could result in hard edges and overcooked, dry brownies…… and nobody has time for that! It is important that you use quality baking pans. The best baking pans are those made from sturdy materials and have the right thickness to cook the batter without burning it. A good pan can stand up pressure without bending. The size of the pan is very important too. Be sure to use the pan size specified in the recipe. If you use a 9 x 13 pan instead of an 8 X 8 pan, it’s going to result in think, crispier brownies. Alternately, if you use a smaller pan, you will get thicker brownies, and there’s a big chance that the middle part would not be properly cooked. Pans are a good investment, so when you buy one, look for the pan that you will be able to use for a longer time. It also pays to have different sizes of baking pans so you won’t have to worry about certain recipe requirements. Alright. Now you know what pan to use for your brownies. The work just doesn’t end here. Apart from the actual brownie baking tin you should consider how to prepare your pan. No worries. It’s easier than selecting which pan to use. Some people don’t really grease their pans when making brownies however this very much depends on the brownie recipe. Prepping your brownie pan is essential as you don’t want to end up having crushed brownies or brownies with uneven sizes because you had a hard time taking them out in the pan. But the question is – how do you properly grease the pan for brownies? Lining the pan with parchment paper is really the best way to go. Using non-stick spray, butter or shortening can speed up the baking process however it is essential that you take real care not burn your brownies. Here at Dello Mano we are not fans of greasing the trays. Flouring the pan is not advisable , as it can cause white streaks (you don’t want that for sure) in your finished baked brownie. The best method to prepare your brownie pan is as I said earlier, with baking or parchment paper. When you line parchment paper onto your brownie pan, make sure to leave at least 2 inches hanging over the side. This will help you easily pull out the entire block of brownie out at once, and then allow you to cut them into beautiful individual pieces. The pan you use has a big role to play in the outcome of your brownie. So make sure you to use the one that best matches the style of brownie that you are dreaming about. Happy brownie baking! Let me know how you go. Got any brownie baking tips you’d like to share – just send me a comment. I’d love to hear from you.